Indulge in a luxury king size mattress for a better night sleep, whether you’re sharing your mattress or can spread-eagle solo all night long! At Brosa, we ensure we’ve got a range of mattresses to suit your sleeping style. Prefer a firm sleeping base? Our firm mattresses are made of two thick layers that support your spine and straighten your back. For those who prefer to sink into a cloud, our plush mattresses are just what you’re after. And for those looking for a good in-between, our supportive mattresses are where it’s at. Our king size mattresses are designed to sync up perfectly with your king size bed base to deliver you a better sleep every night. At Brosa, we want to ensure we’re keeping our own economy healthy, which is why all our mattresses are handcrafted locally in Australia. Keeping with Brosa’s commitment to quality, our king size mattresses are made from the best adaptive foam materials, which translates into a better quality sleep. Still not happy after 30 days? We will offer you a full refund and even collect your mattress from your home! But if it’s a keeper, we’ll give you a 10-year warranty. 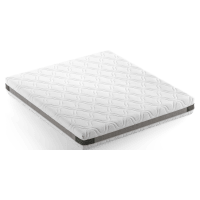 Browse our full range of king size mattresses online at Brosa today.